Michael Caine was in his mid seventies when he made this and as possibly one of his last starring roles chooses to return to his roots. Caine's own humble origins find a resonance in the high-rise housing estate where the dignified and upright character Harry Brown lives in south London. Harry's only child, a daughter, already lies buried in the cemetery. His wife lies in a catatonic state in hospital. Each day he washes his breakfast dishes, puts on his tie and jacket and walks to the hospital to visit. 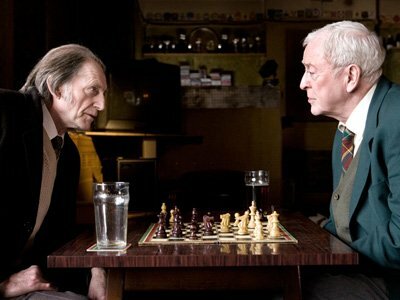 He then meets his friend Len for a game of chess in the local pub over a pint. That pattern seems to be the extent of Harry's life - a stark change from the days of active service he saw in the troubles of Northern Ireland as a Royal Marine Commando. When Harry's wife dies, he stands on the precipice of emptiness. The local estate is controlled by drug-dealing yobs who traumatise the residents and who turn some parts of the estate into no-go areas. Len has been the target of the yobs for some time and he lives in fear of his life. He takes matters into his own hands and ends up dead. Harry has nothing but his dignity and justice left to live for as he tumbles over the precipice. In a film that is strongly reminiscent of Gran Torino Harry Brown puts his quick mind and military training into practise. Rather than the leafy suburbs of Detroit, we get the concrete wasteland of Elephant and Castle - but the rest of the story is remarkable similar. The trajectory of the narrative doesn't take much guesswork. The only twists are provided by the degree of inventiveness that Brown employs to deal with the thugs. As social commentary, it is a powerful indictment of inner-city community policing which can sometimes leave communities isolated and vulnerable. The predictability of the 'good cop' set against an ineffectual police force obsessed with its own vanity is provided by Emily Mortimer who plays DI Alice Frampton. This is a bleak, violent and bloody film that will not be on the list of the London Tourist Office. Its warmth comes from the characters of Brown and Frampton and its morality sees a higher justice engaging with the law of the street in a society that has been abandoned by the judiciary. Is vigilante law enforcement ever a good thing or does it signal the breakdown of law and order, civilisation and democracy? The acting all-round is strong. The way the film is lit and shot maximises the dark grittiness of the bleak urban landscape. Brown's loving kindness shows itself as he tends the graves of his wife and daughter and in being the only mourner at Len's funeral. This contrasts tangentially with his cold professional and detached ability to despatch thugs with seemingly no remorse. His efforts frustrated only by the frailties of his ageing body and emphysema. The twist at the end of the film takes him back to his tours of duty in Ulster. The ever-changing way in which statistics on crime are gathered and presented make it difficult to gauge whether or not the kind of lawlessness depicted in this film is still with us. I suspect that in pockets it sadly is. The film presents a significant challenge to explore how communities drift into this kind of situation and how the police and the courts are seemingly powerless to do anything about it. When this kind of scenario unfolds, it is not surprising that vigilantes emerge - but is their form of 'justice' any more welcome than the inactivity of the police? My sense of justice screams out for it - but two wrongs can never make a right and it seems to me that this is another in a growing list of films that appeal to utility for the means to justify the end. For me, that is a dangerous direction in which to be heading. We need to be careful about our understanding of how art can reflect and at the same time shape society. Would you like Harry Brown living next door to you? If you want to see an English film about thugs 'getting what they deserve' with some very good acting and action, then this is a film for you - enjoy if you can. If you want to see a film that invites debate about how we police our communities and how law and order could work more effectively, then this will offer fertile ground. Or, if you simply want to enjoy a performance from one of cinema's true greats, this will not disappoint. I'll give it 8/10. This was my post Christmas lunch, presents, etc viewing based on your blog! I thought it was a good film - I loved some of the cinematography that captured the atmosphere in some of the more reflective moments......the scenes from Harry's flat etc. It is brutal and nasty, by Michael Caine is excellent and all in all I did enjoy it as a good film. Think I would probably give it an 8.50/10. Glad you enjoyed it Questions. It Is a very good film that captures the mood very well. I'm always open to different views and accept that other opinions are available.